BigUpRadio.com proudly presents the weekly reggae dancehall radio show called "Green Lion Show." Hosted by DJ and producer Zeke Stern, the Green Lion Reggae show features speciality programming in which Stern curates the program based around a unique theme, exclusive pre-releases from the Green Lion catalogue, one on one interviews and Green Lion's signature 'LP Clash' where seminal albums in the history of the music face off and the listener can decide who wins. 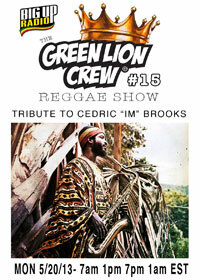 This week it's Green Lion's Tribute to Cedric "Im" Brooks who sadly passed away May 3, 2013. He was a Jamaican Saxophonist and flautist known for his solo recordings and as a member of The Mystic Revelation of Rastafari, The Light of Saba, and The Skatalites. Green lion selects crucial tracks from his discography to highlight his legendary impact on reggae music. Zeke Stern, aka Green Lion, is a deejay, producer and radio host based in New England USA as well as co-founder (with Dana ‘Chai’ Knowles) of the Green Lion Crew sound system. Stern’s credits include the underground crossover hit “Come Down” performed by Collie Buddz included on the Playback EP as well as the More Spiritual Riddim featuring Kabaka Pyramid, Mr Williamz, Million Stylez, YT, and Perfect.